Using a hand-held mobile phone, or similar device, when driving - except to call 999 or 112 in a genuine emergency when it is unsafe or impractical to stop - is illegal and presents a huge risk to road safety. As a training provider I believe this long over due, any Driver, transport manager that knowingly allows drivers to falsify or break the rules should have the heaviest penalty imposed upon them. CPC was introduced completely the wrong, Drivers thought that they was going to be taught how to drive. What should have been said, You can now say NO and have the law on your side. "If you would be happy for your family to drive along side you whilst driving your Truck" then great! If however you wouldn't be happy to do this with your family! "Who gives you the right to endanger my Family"
Defect - Report it every time and if your unsure, then don't take it out. NO EXCUSSES my family are my world! Aren't they yours? Where do they learn to Drive. Every night i see lorry's carry on driving up to red traffic lights, If they are red take your foot of the throttle, then they may have change by the time you get to them. Also when stopped at lights put the hand brake on, do not sit there with brake lights on. This is driving without due care and attention for other road users. And yes i am a lorry driver. As for company's that want you to break the law. report them. and leave, if they sack you take them for wrong full dismissal. Spot on Mike. The transport enforcement and regulation authorities seem to have preferred a punitive approach rather than a concentrated effort of education and professional development for all professional drivers. Using the criminal penal system as an analogy, the fine or sentence relates to an offence and an offender. The current 'buzzword' in the justice system appears to be rehabilitation. The fine may be appropriate and highlights an issue but it won't prevent further offences created by a lack of knowledge? Driving today is the easiest part of the job. From my experience, so far, the DCPC is proving inadequate. Qualification by attendance? There is hope. Moving On is a step forward. We can at least educate each other? Running out of space again! The state of the Nation's Roads are no better or worse than they have always been, the only difference is the increased traffic flow / car ownership and the additional health and safety required when repairing roads or closing a road in the event of an accident. I would agree though that traffic can be very difficult at times and planning a nightmare. There is a trend with large operators switching to shorter shifts / more drivers (especially the large supermarkets) to deal with Driver Regulations (EC 561 / 2006) as well as WTD / HAD / RTD rules on working time. No Operator or driver can afford to ignore EC 561, however I do feel that the WTD rules are being ignored by very small operators through lack of knowledge / clarification. The DVSA (then VOSA) actually stated in the past that they would not enforce WTD regulations stating that the EC Regulations were sufficient. This they later retracted and stated that WTD would be enforced (they probably didn't have much choice!). There is also the question of POA (when to use and when not - of course it should only be used when the period of waiting is known in advance. The reality is that waiting time can be considerable and often a driver will have a very good idea when POA can be used. The problem is that in Europe, POA is counted as working time whereas in the UK it apparently isn't. Yet there is no special rule within the EC Regulations or EU Directives that I have ever been able to locate which allows UK to be exempt from counting POA as Working Time. I feel that the WTD / RTD / HAD additions (Maximum working week 60 hours, 48 hours averaged over 17 weeks, break after 30 minutes work and a further 15 minutes break after 9 hours, maximum 10 hours if night working (if you work any portion of time between 12.00 and 04.00, can opt out of this) to be not just overkill but actually causing confusion. Many get confused that they require a break after 6 hours of work even if they haven't driven more (or even close to) 4.5 hours. Some also get confused between the Maximum working day and minimum daily rest. 15 hour maximum - at work time. Regardless of POA time. This is to do with the minimum daily rest requirement of EC Regs and nothing to do with WTD. In saying all of the above, driver CPC training has improved things - I would still like to see someone put a line through WTD for Transport. These rules were to protect factory workers and apply to very few Transport Personnel. Anyway - does anyone know a driver or other who wouldn't take a break after hours of work? The reality is that drivers are still able to do too many hours under EC rules and perhaps you could argue that the WTD rules are designed to halt this? Perhaps, but it would be much easier to just reduce the hours under EC Regs. In particular six days work in a row is one too many. Why have they passed the law and when did they pass said law that you can't drive for more than 3 hours between the hours of 10pm and 6am I do a lot of night time driving and now they have made my working day longer which means that after the first 3 hours driving I take a 45 min break then drive for another 4 & Half hours take another 45 min break before finishing my last 1 hour & 30min driving time when on long journeys this is more tiring than just leaving me do 4 hours 30 mins then 45 rest then my last 4 hours 30 mins it's bad enough having shut down roads with out making us do longer shifts. What is "Professional" about many lorry drivers today? Their driving is appalling, they have no consideration for other road users, they do not check their vehicles, they do not book defects, even glaringly obvious ones, they do not comply with speed limits. I am not from the anti-lorry brigade but someone who has had to work with such individuals. I started driving HGV's in 1972 but gave up full-time in 1978 and took up another career. I have done two periods of casual work in 1996-2001 and 2008-2013. During this time the standards have plummeted. This is probably true, just remember that Cyclists are classed as vulnerable road users for a reason. They are seldom professional drivers and often have very little training (if at all). You need to look out for them. All the time. In particular at junctions and especially when turning left. Urban areas are of course the most hazardous. I am an agency driver and always do a walk around check. If I find a defect, write it down, report it, but then I'm told I still have to get on the road, and I'm stopped by VOSA, and they see that I have written it down and reported it, will I get in trouble for will the company get in trouble for sending me out. Primerily, you are the Driver, therefore, Any Defect will be recorded and the vehicle must be fixed before you go on the road. Any company willing to let this happen, is not worth working for and if this happened to me, I would report it.! It is the Drivers responsability to record and report defects. Once a VOR certificate is issued, it becomes a legal document and can ONLY Be signed off by a qualified Mechanic, not some two bit manager or desk clerk.! Nobody wants dangerous vehicles on the roads, they are not profitable and recording defects is good practice. Deciding when a vehicle is VOR requires professional informed judgement, an area the driver CPC should cover in more detail. In these cases any evidence to show that the defect has been reported would be taken into account. The action taken by DVSA would depend on the severity of the defect, what evidence is available to show that the defect has been reported and what action was taken once that defect has been accessed. If the evidence shows that the driver has reported the defect (and the defect was severe enough to require a prohibition and a fixed penalty) and the operator has informed him to continue then I would expect an examiner to issue the prohibition but not the fixed penalty. If the only evidence is a written defect sheet that wouldn't show it's been reported so that could receive prohibition and fixed penalty. If on the road when a defect occurs a text to the transport reporting the defect and a reply to confirm the action required would be good evidence that the driver has fulfilled his duty. Part time drivers engaged on school contract work appear to have a perpetual problem with drivers hours legislation. Contracts usually state that journey time inbound or return must not exceed one hour. Dead mileage may take up an extra hour each day. The drivers, therefore, average three hours a day driving within a 50km radius currently under domestic rules. According to current information (Transport's Friend appears clearest) no records are necessary? By Friday the employees weekly driving amounts to 15 hours. Adding an hour a day for walk round checks and cleaning - 20 hours work. OK if you have a nice pension. Work may be available under EU rules Saturday and Sunday. Can the driver work both, either or neither? Assuming 2 X 10 hour shifts the total driving would only amount to 35hours. Any case law examples would be helpful. i agree with kenny rowe, CYCLIST MUST OBSERVE THE RULES OF THE ROAD. I have regularly passed a cyclist with (my maximum count was) 46 cars and vans behind it. Who can I report a company to for encouraging drivers to break the law by working 15 hour shifts every day and other things like driving without a card. You can report this by contacting us on 0300 123 9000. You can also email enquiries@vosa.gov.uk if you would prefer, this will then be passed onto the relevant department. It's about time HGV drivers got a fair hearing about all these rues ! Soon you won't have any drivers to worry about until they get a fair deal . Non GB Operator or Non UK Driver stopped for mobile phone use will receive a VW (Verbal Warning), according to the latest Enforcement Sanctions Policy. So some Drivers and Operators are subject to Conduct Standards and some are not. Cyclelist do no travel up the side of a lorry when stationery that way you will not be killed or injured if the lorry turns left. 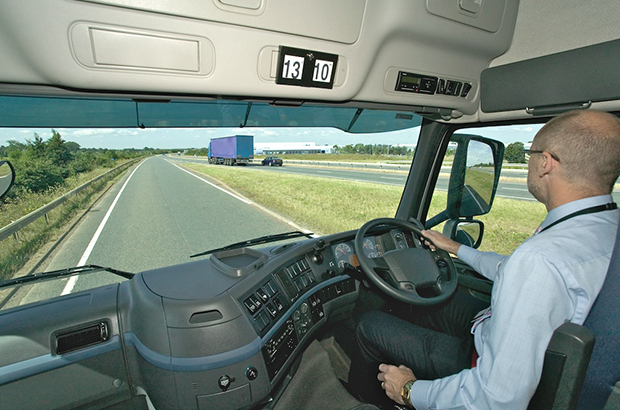 Some of the fines imposed on lorry drivers financially are more than some corporate manslaughter cases and result in the driver losing his employment? You can call drivers professional but if companies don't treat them as such except when facing disaplinary what does it really mean? POA how do you enforce such a rediculous scheme? Professional way of making drivers hours meaningless impact on health and safety and WTD?